The post 10.5 Million Lumia’s Sold in Q4 2014 appeared first on OneTechStop. Microsoft have published their Earnings Release for Q2 of the fiscal year of 2015, more commonly known as the 4th quarter of 2014, which include some healthy profits and sales increase. Sales of Lumia devices, something I have been interested in since Nokia first launched the range of Windows Phone devices in October 2011, is at an all time high, selling 10.5 million devices between the start of October and the end of December, up 12.4% on the previous quarter and up 21.9% on the same three month of 2013 (year on year). The report attributes the growth to “growth in affordable smartphones”. Revenue from Lumia is quoted at $2.3 billion. Other figures include sales of 6.6 million Xbox consoles, this includes both the Xbox 360 and the Xbox One. Search advertising revenue up 23% with Bing market share growing 19.7%. · Windows volume licensing revenue increased by 3%, with annuity revenue growth partially offset by declining transactional revenue. You can read the entire Earnings Report yourself on Microsoft’s site by clicking HERE. 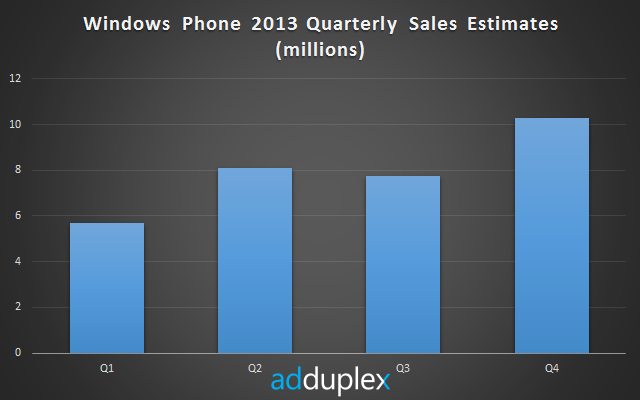 The post AdDuplex Estimates Record Number Of Windows Phones Sold to End Users in Q4 2013 appeared first on OneTechStop. AdDuplex, who publish monthly Windows Phone statistics based on their network of apps, have estimated that Q4 2013 saw record numbers of Windows Phone devices sold to end users, following Nokia’s admission that sales of Lumia devices which make up over 90% of Windows Phone sales, were down on the previous quarter. Despite Nokia announcing 8.2 million Lumia devices were sold in the three months ending December 2013 which was down 7% on Q3, AdDuplex have posted on their blog that over 10 million Windows Phone devices may have been sold to actual users, which if right would mean over 9 million of those were Nokia branded, unless market trends have changed quite drastically. AdDuplex also make an estimate at how many Windows Phone 8 devices are in use at the moment, which they say are around 35 million. You should take a look at their whole blog post for more information, which makes interesting reading. We should soon get Gartner’s report into the last quarter, which specializes in device sales to end users, and it will be interesting to see if they say a similar thing or not. The post Lumia Outselling iPhone, Quarter by Quarter By 3 Million appeared first on OneTechStop. I made this comparison before, comparing the sales of Nokia Lumia devices against those of the iPhone in the corresponding quarter, Example; Quarter 4 2013 was the ninth quarter of Lumia availability against iPhone sales in their ninth quarter of availability which was Quarter 2 2009. This is by no means a fair comparison for a number of reasons, price points, market trends and so on, but it still makes for interesting reading. The graph below shows how the two brands of smartphones have performed in their first nine quarters. To add up the numbers overall, in the first 27 months of Lumia sales a total of 44.2 million devices sold, compared to the iPhone which sold 26.4 million in their first 27 months. A look at iPhone numbers further on shows that it took Apple another two quarters to reach the sales of Lumia revealed in yesterdays earning report. So while it was disappointing to see Lumia sales dipped in the last quarter it is worth noting that their sales are actually growing quite a bit faster than the iPhone did. The post Nokia Announce Q4 2013 Lumia Sales of 8.2 million appeared first on OneTechStop. Earlier today Nokia released their Nokia Corporation Q4 and full year 2013 Interim report which revealed a number of things about the Finnish company’s performance, but didn’t actually state how many Lumia devices had been sold in the last quarter. They have since made the announcement that in the forth quarter of 2013 8.2 million Lumia devices were sold, down 600,000 (6.8%) from the previous quarter. This is an unfortunate dip in sales of Nokia smartphones (excluding any Asha device sales) as the range of Windows Phone devices had been growing steadily over the previous 12 months. Q3 2014 is set to be the last full quarter where Nokia will be producing the devices, with the Devices and Services Division in the process of being sold to Microsoft. Due to Nokia making up as much as 92% of all Windows Phone sales it looks like the platform on the whole may see a fairly poor quarter in terms of sales. Over all in 2013 Nokia sold 30 million Lumia devices, up 44% on 2012. The post Nokia’s Q4 2013 Results, My Prediction appeared first on OneTechStop. Tomorrow (January 22nd) Nokia will release their Q4 2013 sales report. For the last few quarters I have made predictions on the numbers we’d get from Nokia regarding their sales, particularly focusing on smartphone area. In the last quarter (Q3 2013) I predicted 8.3 million Lumia devices would have been sold, I was out by 500,000 units, they actually sold 8.8 million, a 19% increase over the previous quarter. This time around I have been trying to work out if the growth (if any) will be higher or lower. Leading up to the holiday season Nokia had their Lumia 520 on some really good offers, and Kantar World Panel numbers show that Windows Phone, on which Lumia smartphones run (not to mention dominate) has been gaining market share. We did of course see a new flagship, the Lumia 1520 launched, but I do not believe the high end Lumia devices make a huge impact on sales. With this in mind I believe these factors have supported but not increased the Lumia brand, so am predicting that we will see a 15% growth on the last quarter, meaning sales of 10.1 million devices. If this is accurate then it would mean Q4 2013 is the first quarter where Nokia have sold more than 10 million Lumia phones, which is great news. Nokia also count Asha full touch devices among their smartphone sales (somewhat controversially), which in Q3 sold 5.9 million, up 37% on the previous quarter, so I am going to hazard a guess at their sales too. We saw three new Asha full touch devices announced in October, the Asha 500, 502 and 503, all ranging in price from about $60 to $100 with the latter bringing 3.5G connectivity, so I believe these will boost the numbers, but only by 10%, so 6.5 million will be my guess. While I’m at it I may as well tale a stab at non smartphone sales, last quarter saw 55.8 million non smart Nokia devices sold, and I believe this will decrease by a few percent, possibly as much as 9%, so my guess is 51 million. As far as profit and operational costs go, I’m not gonna make a guess. So to sum up, Nokia will sell a total of 16.6 million smartphones, up 12.9% from Q3 2013 when total sales of Lumia and Asha full touch devices sold 14.7 million. With Nokia in the process of selling their Devices and Services Department to Microsoft I do wonder if we’ll be able to track sales of Lumia smartphones after this quarter, I certainly hope so. I would be very interested to hear your views on my predictions, or if you have any yourself, be sure to leave them in the comments section. The post Lumia Vs iPhone Sales – Just For Fun appeared first on OneTechStop. The first post I ever did for Nokia Innovation took a look at how Nokia Lumia sales compared to the iPhone in its comparative quarter. 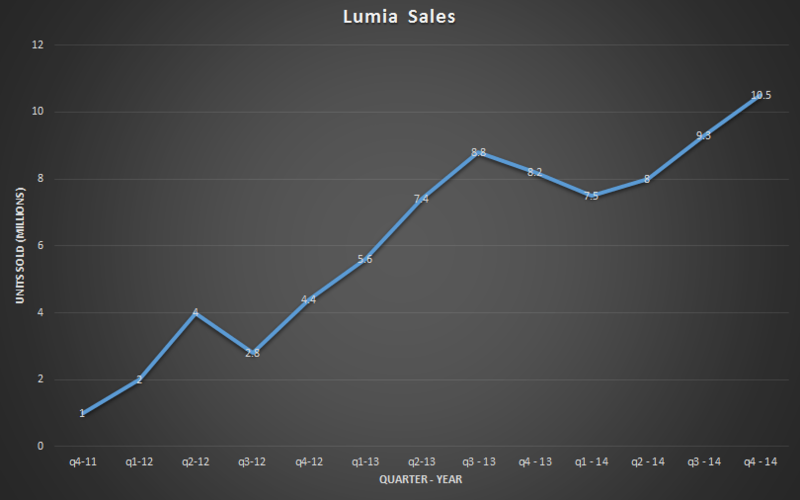 For example; iPhone sales in the 3rd quarter of 2007 (it first full quarter) against Lumia sales in q4 2011 (first quarter of Lumia availability). Make sense? As you can see, iPhone sales dropped to 4.4 million in q4 2008 compared to Lumia sales which rose to 7.4 million. Over all it means 27.2 million Lumia’s have been sold in 21 months against 17.4 million iPhone’s in the same amount of time. As a reference point, back in q4 2008 the iPhone 3G was the flagship Apple Phone, which had been released in June 2008. One big factor for the reader to be aware of is that the above has so many factors to consider, such as buying habits back in 2007/08, the cost of devices, countries of availability and so on that it is only really a relevant as a matter of interest. It is a testimony to how successful the iPhone has been that I make a comparison in the first place.